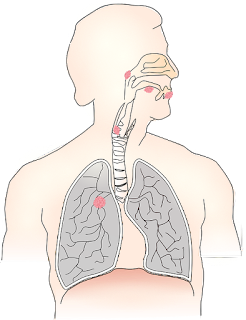 Lung cancer is the term used to describe the growth of abnormal cells lining the trachea inside the lung. These cells divide and grow more rapidly than normal cells. They are cancerous cells that combine to form a cluster or tumor in the lung. If the cancerous cells originate in the lungs, the tumor is called a primary lung cancer. However, if some lung cancer cells are able to move through the blood vessels, they get attached to another organ of the body and continue growing. This growth and movement of the new cancerous cells is called malignant tumor or a secondary lung cancer. Smoking is a major factor in the development of lung cancer. Repeated exposure to chemical fumes and gasses such as radioactive radon gas. Acute and chronic cough accompanied by blood. Change in the color, intensity and volume of coughing up sputum. Great weight loss without known reason. General feeling of fatigue and weakness. Feeling of pain in chest, shoulder, arms or back. Repeated exposure to radon gas. Repeated exposure to cancerous minerals and chemical materials such as: asbestos, uranium, diesel, arsenic, silica, nickel compounds, coal products, mustard gas, chrome ... etc. Previous radiation therapy of the lungs. Accumulation of fluid in the lung. Spread of the cancer to other parts of the body. Physical activities on a regular basis. Maintaining a healthy diet full of fruits and vegetables. Consulting your doctor and periodic follow-up. Avoiding exposure to cancerous chemical materials. 0 Response to "Lung Cancer"